Don’t you just love watching the Academy Awards? Whether you watch it to critique the fashion and style on the red carpet, to catch a glimpse of your favorite actor or actress, or to see if your favorite movie wins, there is something for everyone! I’ve been busy creating some great ways for you to enjoy the Oscars this year with family and/or friends by throwing an Oscars viewing party! 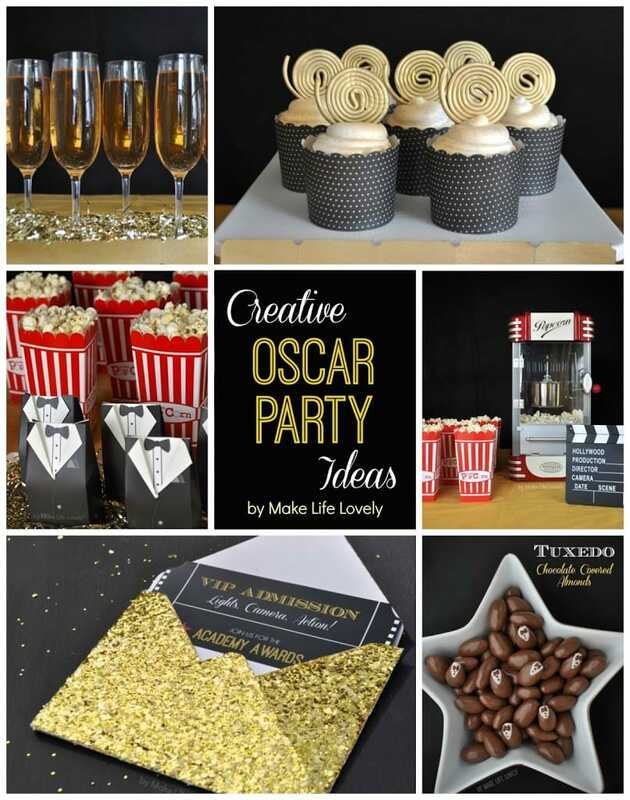 I’ll be sharing tons of fun food, drink, invitation, ballot, and decorating Oscar party ideas for you party to be amazing and worthy of the red carpet! To get ready for my Oscar party, I went shopping where I always go to prep for a party- World Market! World Market so many great dishes and party essentials that are perfect for entertaining, as well as lots of gourmet food and drinks from around the world. The first thing you need when prepping for an Oscars viewing party are invitations. I created these free printable Oscar party invitations for you to download, print, and pass out to your party guests! I created them to look like tickets, and in this post I show you how to make a glittery gold envelope to put them in. Once the invitations are passed out, it’s time to go shopping for food and some party dishes! I wanted this party to look great, but be easy to put together. One of my favorite finds at World Market was this retro popcorn maker, which looks amazing, and is just perfect for the Academy Awards since the movies and popcorn go hand in hand. World Market also sells some cute paper popcorn boxes that perfectly match the popcorn maker…. gotta’ love that! I wanted to serve cupcakes to match the theme, so I decided to go with some gold film reel cupcakes made from licorice wheels. To give the edible film reels some sparkle and shine, spray them with edible gold paint. Spray the wheels and top of the cupcakes with the gold paint just like you would with regular spray paint. You might need a couple coats of paint on the licorice wheels. Place one “film reel” on the top of each cupcake. I just love the way they turned out!! Another fun treat to serve are these tuxedo chocolate covered almonds. They are so impressive to serve, but I promise they aren’t as hard as they look to make! Simply start with some chocolate covered almonds, and follow the directions in my tutorial to make the cutest little almonds, all dressed up in a suit and tie. You’re basically just painting on a white triangle for the shirt, a tiny black bow tie, and a couple little dots for buttons with chocolate bark or melts and a toothpick. I found these small tuxedo boxes that were perfect for holding treats for guests! While watching the Oscars you have to have a little bubbly, so I picked up some of my favorite orange mango passion fruit Italian soda and mixed it with ginger ale for a delicious drink that looked amazing in the Madison champagne flutes. These glasses look amazing, and would you believe that they only cost $1.99 each? You can bet that I stocked up! To decorate make my food table, I spray painted some regular tickets from the party store (originally green) a pretty gold color, and attached them to the front of my cake plate and serving platters with tape. I also used some metallic gold shreds on a platter to hold the drinks. Both of these decorations added a lot to the table without taking a lot of time and effort or costing a lot of money. For more Oscars inspiration, be sure to check out our Sparkling Oscars Night Party we created for Oriental Trading Company’s Fun365 site. You’ll find lots of creative Oscars ideas and a FREE printable Oscars Bingo game! Such cute ideas! Love the tuxedo almonds, clever! Where is my invite? I LOVE your Oscar party and those film reels–so clever, my friend!